When I first saw pictures of the new Butter London winter collection, I wasn’t too interested because I didn’t think the polishes were that unique. That was until I saw Scuppered, which I originally reviewed here! I couldn’t get over how unique it was! A brown with gold and pink shimmer and green glitter? Who does that!? 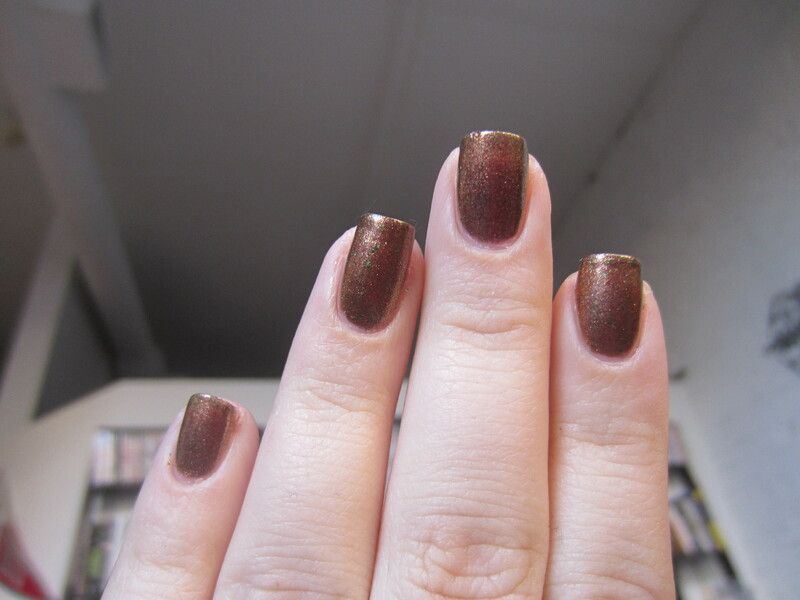 After spending $14 on this bottle of magic I realized that it was sort of similar to a stunner from a holiday collection last year, OPI “Warm & Fozzie”. Keep reading to see just how close they really are and which one wins for me! I’m just going to point out the obvious differences before I post the pictures. Scuppered has green glitter pieces in it. There aren’t that many pieces of glitter in the formula but they are there. So I can’t say that these polishes are actual dupes. This post is more to show you just how similar they are and you can determine if you need both, or if you don’t have either of these which one is worth the money. Aside from the glitter can you see a big difference in the polishes?? I can’t! They’re really similar. There are a few differences that I noticed that I can report back. First, Warm & Fozzie has a stronger pink shimmer than Scuppered. Scuppered has a slight pink shimmer but it isn’t as noticeable. Second, Warm & Fozzie is much more sheer. Scuppered was almost opaque in 1 coat, but 2 are in all of the pictures while Warm & Fozzie needed 3, and you can see from the 3rd picture that you can still see a visible nail line when you are in direct sunlight. Other than those 2 differences, these polishes are very very similar. My verdict, if you have one you don’t need the other. If you were thinking of picking up Scuppered and still have access to Warm & Fozzie, it might be worth it to save yourself the $6 (depending on where you live). 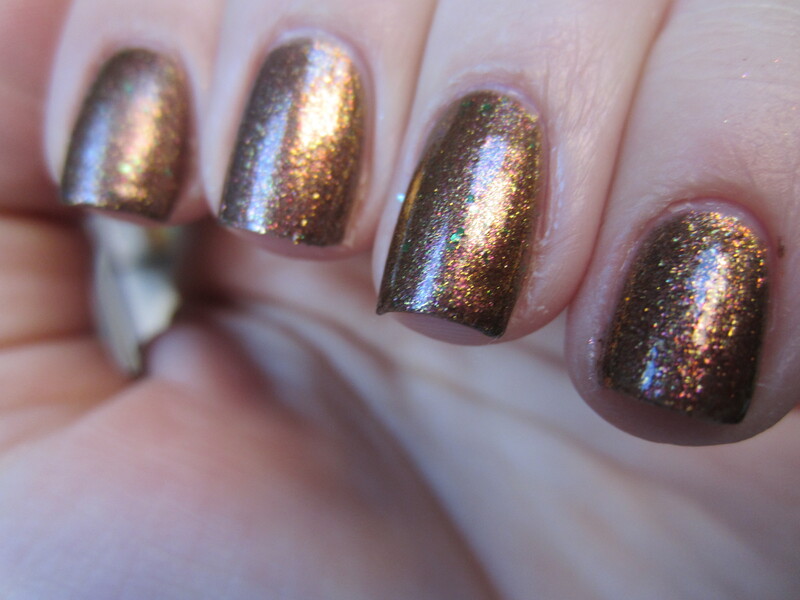 And since Butter London isn’t the most accessible polish, OPI might be a better choice. 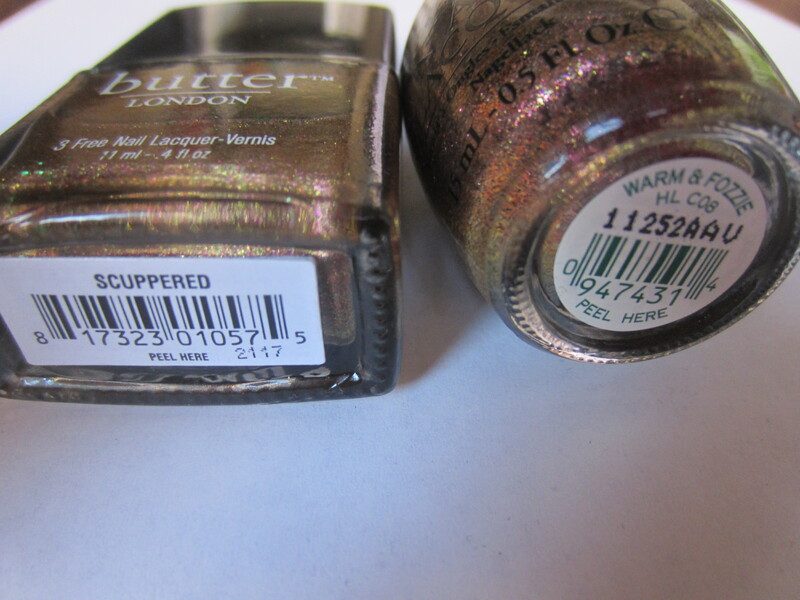 Out of the two, I like the OPI for the price and color but Butter London for the formula and the green glitter. But you can always grab a green glitter with the money you’re saving with the OPI. What do you guys think? Which one do you prefer? Do you have either of these? Awesome post!!! I was so sad i missed out on Warm & Fozzie, glad they’re close enough!! 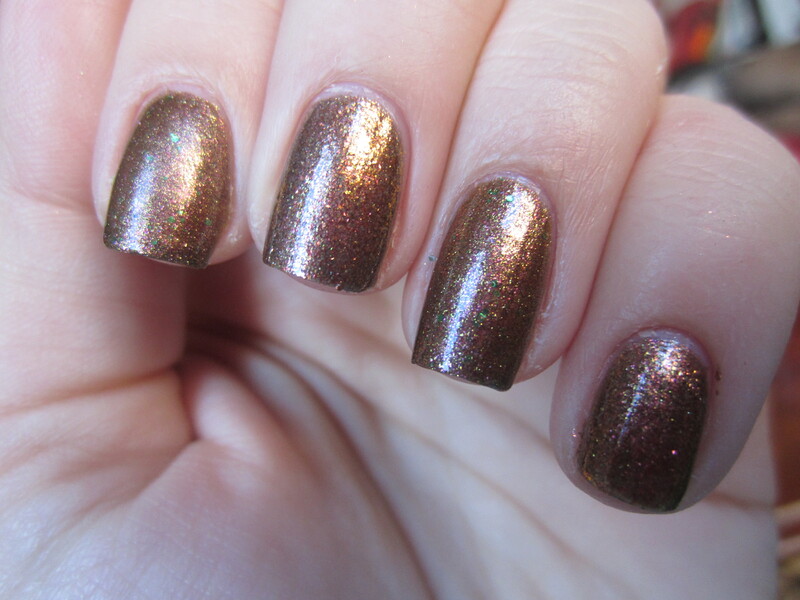 i found Warm and Fozzie last week at my local TJ Maxx along with a few other awesome discontinued OPI colors, plus they only cost about $4.25 .. total steal! try looking there if you have one around you ! Ooh I want to try it. The shimmer combo sounds lovely! awww thanks for the reblog! it is really pretty but super expensive! Thanks for posting Holly – I love both of these and they do look REALLY similar. Now I have options. YAY! 🙂 I will see what I can track down. yeah they look so close! Wow, they look almost identical! I seriously can’t tell them apart. Great comparison! awwww thanks!!! i’ll definitely have to do that! 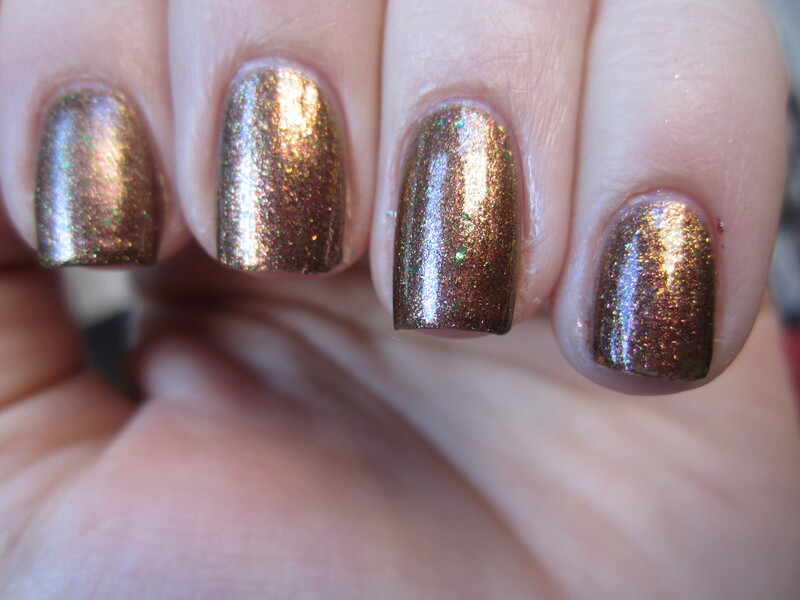 Warm and Fozzie was my favorite polish ever. And I just bought Scuppered, and when I swatched it at home I was like oh no its a dupe and I just spent $16… I guess I will just have more of my favorite polish!